Thanks to your support, NAGR was able to make great strides in taking back your gun rights this year. But, with anti-gun radicals like Nancy Pelosi (D-CA) and Maxine Waters (D-CA) calling the shots in the next Congress, we're facing a gun control onslaught. That's why I urge you to renew your membership today! With committed members like you on the front lines, the Second Amendment will stand strong in the face of its enemies! As an NAGR member, you can renew your membership for just $35. But, I hope you will go above and beyond by upgrading your membership to the $65 level. This will help ensure we have the resources necessary to go up against the extreme gun control legislation that is being crafted as we speak. And if you can afford it, please consider becoming an NAGR Lifetime Member with a one-time contribution of $1,000. 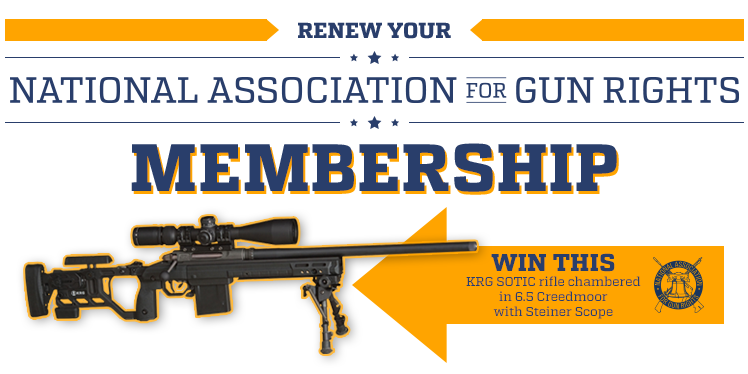 As an added bonus, if you renew today you will also be entered to win a KRG SOTIC Rifle and Steiner Scope - valued at over $7,500! As our thank you for renewing your NAGR membership, you get a free subscription to the Gunpowder Magazine! Paid for by the 4.5 million members and supporters of the National Association for Gun Rights, a tax exempt non-profit organization under IRC 501(c)(4) which does not endorse, support, or oppose candidates for election. Contributions are not tax-deductible. PO Box 1776, Loveland, CO 80539 PH 877-405-4570 www.NationalGunRights.org/ Not produced or e-mailed at taxpayer expense. Contributions are not tax deductible.